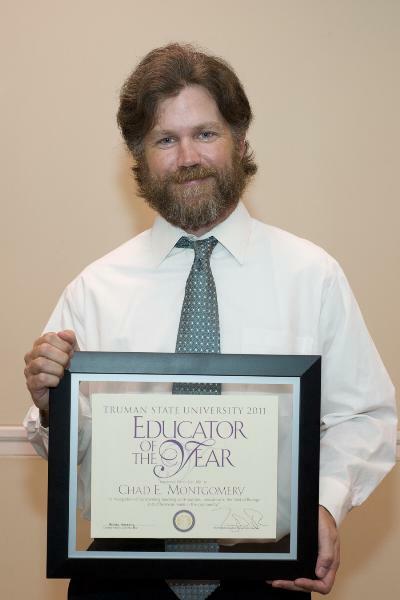 Chad Montgomery, assistant professor of biology, received top honors at the 22nd annual Educator of the Year Banquet March 21. Montgomery began teaching at Truman in 2007. He is the director of the biology graduate program and is an adviser for three organizations. Montgomery teaches Introductory Biology I and II, Herpetology and Environmental Physiology of Vertebrates. After receiving a bachelor’s degree in biology at Truman, Montgomery went on to earn a master’s thesis degree at the University of Northern Colorado. After receiving his M.A., he attended the University of Arkansas to study the effects of foraging mode on life history in copperheads and timber rattlesnakes for his Ph.D. Montgomery then moved to Panama as part of his postdoctoral work examining the effects of amphibian decline on snake communities. Montgomery still conducts research in Central America, including a project examining body size variation in boa constrictors on islands off of the north coast of Honduras. In addition to Montgomery, this year’s finalists included Jesse Krebs, Shirley McKamie, Carol Marshall, Bob Matthews and Donna Rhinesmith. Students from the Pershing Society, Student Government and Phi Kappa Phi serve on the Educator of the Year Committee. The Index was recently recognized with three prominent awards. Missouri College Media Association named the Index the best college newspaper in the state. At the MCMA awards ceremony on April 2, the Index received more than a dozen awards, including first place in Division Two and Best in State. The Index defeated nearly 30 schools to clinch the title, including University of Missouri-Columbia, Missouri State University and Northwest Missouri State University. Last year, the Index placed second in its division. The Index also won first place at the Society of Professional Journalists regional competition for best four-year non-daily newspaper. The region consists of Missouri, Iowa, Kansas and Nebraska. The award, known as the Mark of Excellence Award, was presented in Overland Park, Kan., the weekend of April 9. The College Media Advisers also awarded the Index third place in the national Apple Awards in New York City March 15. The Index competed with nearly 30 schools to place third nationally at the CMA Apple Awards. The Index has placed first at the Apple Awards five times since 2003, most recently in 2010. 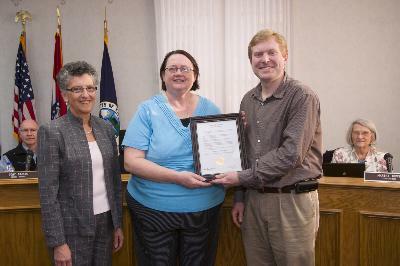 Shelia Garlock, assistant professor of communication disorders and chair of the Graduate Education Week committee, (middle) accepts a resolution from the Kirksville City Council commemorating Graduate Education Week. The resolution was presented at the April 4 meeting by then mayor Todd Kuhns. Pictured, from left: Maria Di Stefano, dean of Graduate Studies; Garlock; and Kuhns. The program will feature presentations from professors and current graduate students, booths set up with program highlights and professors and students available to answer questions. pose for a photo in the Student Union Building April 7. 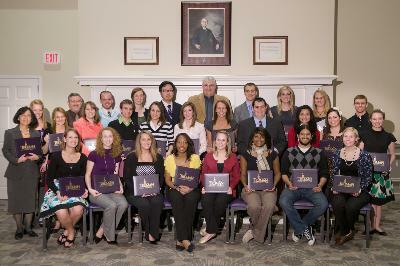 The Center for Student Involvement (CSI) presented the 2010-2011 Leadership Recognition Program (LRP) Awards April 7. This program is designed to honor Truman students, advisers and organizations for their dedication to their peers, the campus and the Kirksville community through various leadership roles during the year. Featured speakers included President Troy D. Paino, Isaac Robinson, Ki’ara Cross and Elise Bailey. Colleen Pace and Jeff Sachs served as the emcees for the event. Cardboard and Paper: The Sheltered Workshop, a local non-profit organization, will pick up cardboard and paper on campus. It will provide indoor containers for paper and pick up cardboard from existing outside bins. Housekeepers in buildings will move paper containers to designated locations near building entrances for pick-up. Aluminum: Truman staff and student workers will continue to pick up aluminum and transport it to a local recycler, Perfect Metals. This company will pay the University. Toner Cartridges: Campus Mail Services has taken over the packing and shipping of used toner cartridges. Please send used cartridges in a plastic bag. University Electronics: Electronics which are not sold at surplus auctions will continue to be disposed of properly. This is for on-campus use only and not for use of any home electronics. Plastic: Currently no companies or organizations have been found that are willing to come to campus or to a centralized location to pick up plastic for recycling, so as of right now, the University will stop collecting plastic. The University will continue to search for a company who will pick up plastic in the future. Glass: The ground glass product Truman has been producing is currently not in demand. Therefore, the University will stop collecting glass and also stop operating the glass grinding machine. Truman is working with the Solid Waste Management Districts in the state to find an organization who will take the machine to use. The University is interested in finding a company willing to pick up glass for recycling. Drop-off Service: The current public drop-off service at the Delaney-Baldwin complex will close. Cardboard and paper items may be dropped off in bins outside the Sheltered Workshop, at 1001 Osteopathy Street, and High Hope Recycling, at 906 E. Shepherd Avenue. Perfect Metals, at 3602 N. Industrial Road, and other metal recyclers in Kirksville, will pay for aluminum cans if they are brought to the facilities. Be conscious of ways to reduce, reuse and recycle and be thoughtful in your buying choices to promote these principles. Drink coffee in a mug instead of using disposable containers. Use e-mail instead of paper. Recycle your aluminum cans. A used aluminum can may be recycled and back on a grocery shelf in just two months. Turn off your lights and computer when not in use. Purchase tickets on the Quad during tabling or through e-mail at Truman.earthweek@gmail.com. Include quantity and, if paying with a meal plan, student ID number. Meet in the parking lot between Magruder Hall and the Student Union Building to carpool to Big Creek Conservation Area. This documentary shines light on human trafficking issues throughout the world. Free of charge. Donations will be collected at the conclusion of the showing to support anti-trafficking efforts in Nepal. Visit http://callandresponse.com or contact Paul Chisholm at pjc4427@truman.edu. Wooden Nickel, Papa Johns, Pizza Hut and Sodexo will compete for the title of Best Wings in Town. This event is sponsored by Truman Intramurals. Tickets are available now at the membership services desk in the Student Recreation Center and also the day of the event. 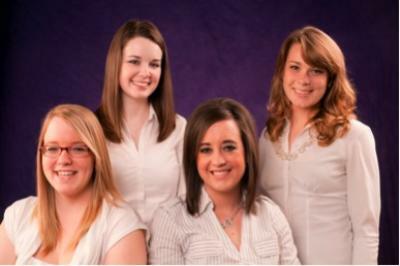 The Career Center is pleased to announce its new interns for 2011-2012. From left to right: Laura Boville, Human Resources and Management; Kayla Martin, Event Planning; Magen Reynolds, Public Relations; and Sarah Cutler, Employer Relations. Senior psychology majors will present the results of their capstone research. The University community is welcome to come anytime between 1-4 p.m. to view the posters and speak with the researchers. RSVP by April 20 to mcnair@truman.edu. A collection of Pictures of the Year International photographs are on display in the Library. Pictures of the Year International began as a photographic contest in Columbia, Mo., in 1944 and grew to become a worldwide competition. The purpose of the contest is to pay tribute to photographers for their hard work and commitment. Pictures of the Year International is a way to both honor photographers as well as raise cultural, political, social, economical and environmental awareness. The photographs remain beautiful while portraying the serious issues of war, famine, natural disasters, endangered wildlife, disease and victims of violence. The photographs are on loan from Missouri School of Journalism until May 8. This display is sponsored by Truman’s Women of Sigma Lambda Gamma. The Jack J. Isgur Foundation is accepting applications from students enrolled in the field of education in the humanities, such as literature, fine arts, music, art, poetry and dance. The Foundation awards scholarships to students studying at colleges and universities who indicate an interest in teaching courses in the above-described areas in school districts located in the state of Missouri, preferably rural school districts. The scholarship is available to those at the junior and senior levels, as well as graduate students.For further information or a scholarship application, stop by the Financial Aid Office, McClain Hall 103 or call 785.4130. Deadline for submission is May 1. The William M. Reiss Foundation is offering scholarships to graduates of publicly supported high schools located within the city limits of Belleville, Ill. Official college transcripts are required and a copy of the Student Aid Report from the FASFA is recommended. Students from Belleville can stop by the Financial Aid Office, McClain Hall 103 for more information on how to apply. Applications are due May 1. The Press Club of Metropolitan St. Louis is inviting media communication and journalism students to apply for scholarships for the 2011-2012 academic year. Students of journalism or related fields who are residents of the St. Louis metropolitan area—City of St. Louis; Franklin, Jefferson, Lincoln, St. Charles, St. Louis and Warren counties in Missouri; and Bond, Clinton, Jersey, Madison, Monroe and St. Clair counties in Illinois—are eligible to receive these scholarships. Applications are available online at http://stlpressclub.org/scholarships.html. Deadline for applications is May 2. Strategic Name Development is offering a $2500 scholarship opportunity for undergraduate students majoring in linguistics, English, marketing, or mass communications with at least a 3.0 GPA. Applications are available at http://namedevelopment.com/scholarship/. Application deadline is August 15.
AES Engineers is providing $500 scholarships to high school seniors or college students, regardless of courses being studied, who meet certain criteria. Scholarships are intended for future leaders across a wide spectrum of fields of study. Students must submit an essay of no more than 1,000 words in answer to one of the questions posted at http://aesengineers.com/scholarships.htm. Deadline for entry is Oct. 7. An information session on a study abroad program at the Universidad de Burgos will take place from 6-7 p.m. April 18 in Violette Hall 1142. Tom Capuano, professor of Spanish, will lead the information session. Many courses are offered and all are welcome. H.E.A.L. Japan Merchandise is available now in the International Student Affairs Office (ISAO) in Kirk Building 120. Stickers cost $1, bracelets cost $3 and T-shirts cost $14. All profits will go to Red Cross America. Truman’s Agriculture GardenGals practicum group will host starter plant sales from 10 a.m.-2 p.m. on multiple days. Sales will take place April 19 inside Magruder Hall; April 20 and 21 inside the Student Union Building; and April 23 outside of Tractor Supply Co. Heirloom tomatoes, peppers and herbs will be available. To pre-order plants, e-mail tsugardengals@gmail.com. Orders will be available for pick-up at any of the selling dates listed above. AIGA will be selling coffee and donuts from 7 a.m.-3:30 p.m. April 19-20 on the Quad. All items will cost 50 cents. A public lecture entitled “Burning Issues in Asian American Studies” will be presented from 7:30-8:30 p.m. April 19 in Baldwin Hall 251. Huping Ling, professor of history, will explore the changing status of Asian Americans in the United States over time and the evolving global environment involving the U.S. and China. AAUP Faculty Brownbag Lunch will take place from 12:30-1:30 p.m. April 20 in the Student Union Building Spanish Room. Participants should bring their lunches from Mainstreet. For more information, see http://aaup.truman.edu or contact Marc Becker at marc@truman.edu or 785.6036. Four students who studied abroad in Ghana will share their experiences from 6-7 p.m. April 21 in Violette Hall 1312. Students will be taking questions about their study abroad trip in addition to presenting. Members of the Center for International Education Abroad Office will also be present to answer any questions. The Truman Observatory will host an open house from 8:30-10:30 p.m. April 21 at the University Farm. For more information and directions, go to http://observatory.truman.edu. ROTC Branch Orientation Day will take place from 3-5 p.m. April 21 at Truman’s rugby field. Numerous branches of the military will have displays including equipment and information pertaining to their military occupation. A presentation about the study abroad program Semester at Sea will take place from 3-4 p.m. April 26 in Violette Hall 1000. Representative Kelly Wilkinson will provide a brief information seminar followed by a Q&A session. This event is open to all students, and students can find more information at http://semesteratsea.org. The One Act Festival hosted by the Theatre Department’s directing class will take place at 8 p.m. April 27-29 in the James C. Severns Theatre. Three one acts will be performed each night. Admission is free. Franklin Street Singers will perform its final concert at 4 p.m. April 30 in Baldwin Hall Auditorium. The concert has free admission and will feature songs such as “Somebody to Love,” “You Can’t Always Get What You Want” and “Viva la Vida.” Franklin Street is Truman’s premier show choir.